All Gift tickets are non-refundable, have no expiration on amount paid. If it is a “promotional Gift Ticket” (a ticket offered at a discounted price from the normal retail value) the promotional value expires 1 year from purchase date, however the amount paid never expires. Ballooning is a weather dependent activity; inclement weather is not a valid reason for a refund (ticket remains valid for a reschedule). With regards to balloon flight tickets there is an additional fee for weights exceeding 220lbs per person. Additional fee for holiday weekends & festivals on promotional gift tickets. Gratuity is not included with any of the gift tickets. 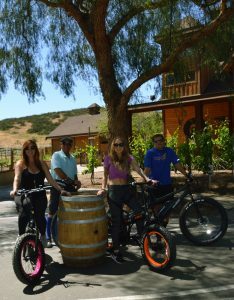 Give the gift of Temecula Wine Country! A customizable gift ticket is available for $25 or more towards any tour or charter offered through Uncorked Tours! These gift tickets by dollar amount never lose their value, never expire and are transferable. Winery Or Brewery Tour Gift Ticket! Buy Now for only $89 per person! Give the taste of Temecula Gift Ticket! Our most popular tours! Upon booking the gift recipient may pick if they would like to redeem for the wine or brew tour! Cheese samplings, crackers, chocolate or “munchies” if brew tour is booked and water is also served aboard (Lunch/dinner orders can be accommodated for an additional fee and often times available at the wineries/breweries)! Certified Wine & Spirit Tour Guide is there to go over wine education, history, take care of your purchases, and snap 50 plus photos throughout your outing (posted to our Facebook page for free, www.facebook.com/uncorkedtours ) ! Special occasion memento offered (varies from souvenir glass and or cork necklace)! Pick-Up Drop off locations from: South Coast Winery or Embassy Suites in Temecula; other locations by quote. Non-refundable tickets, amount paid never expires, promotional value expires 1 year from purchase date; gratuity not included, parties of 4 or more require pre-paid gratuity. Good for Either A 4 Hour Wine Tasting Tour or Sunrise Hot Air Balloon Flight For Two! 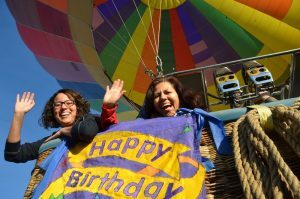 All Uncorked Tours’ ballooning gift tickets give that Easy Peaceful Feeling by being an Either or Ticket, giving your gift recipient the option of redeeming their ticket for either the wine tour or balloon flight. This EASY PEACEFUL FEELING TICKET ensures that those who prefer to keep their feet on the ground or those that are looking forward to getting carried away are accommodated! 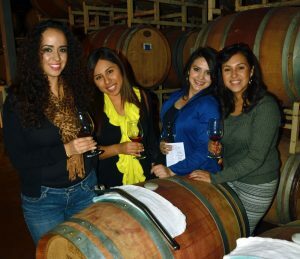 100 plus photos taken throughout the outing (free on facebook, www.facebook.com/uncorkedtours )! Non-refundable ticket, amount paid never expires; promotional value expires 1 year from purchase date. Ballooning is a weather sensitive activity; inclement weather is not a valid reason for refund. Gratuity not included; parties of 4 or more require pre-paid gratuity. Ultimate Wine Country Gift Ticket! Sky To Vines Package Available Now for only $578 for two!! 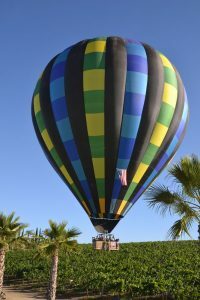 This popular group package includes a Sunrise Balloon flight and 4 Hour Wine Tasting Tour for two!! Call for tour availability and tickets! Actual flight time of 45-60 minutes with champagne served aloft too! 100 plus photos taken throughout the outing (free on facebook, www.facebook.com/sunriseballoon )! After your balloon flight there is approx. an hour to an hour half of private time to enjoy breakfast on your own or site see Old Town Temecula perhaps, before you embark on your 4 hour wine tasting adventure! Cheese samplings, crackers, chocolate and water is also served aboard (Lunch orders can be accommodated for an additional fee and often times available at the wineries)!